Matsumoto Shunsuke was Born April 19th, 1912 in Shibuya, Tokyo, under the name of Sato. He spent his childhood in Hanamaki, Iwate Prefecture, and in Morioka as well and in 1925 entered Morioka Middle School. Funakoshi Yasutake was in the same grade. The same year he entered school he caught epidemic cerebrospinal meningitis and lost his hearing. 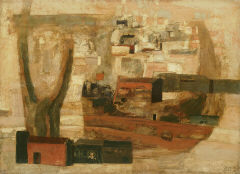 As a result of his hearing loss he began to have aspirations to becoming a painter and in 1929 his third year of middle school he left school and moved to Tokyo. While taking elective courses at the Taihei Yogakai Institute, he became close with Aso Saburo and Terada Masaaki. 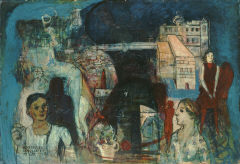 In 1935 he presented works in the Fifth Nova Exhibition, and his work Buildings was first accepted in the 22nd Nika Exhibition. He continued presenting in the Nika Exhibitions until 1943. In that time, as well as receiving an award for Cityscape in the 27th Exhibition and being recommended for the Nika society member for his Portrait of the Artist in the 28th Exhibition, he also presented Standing Figure (29th Exhibition) and many others. He also participated in the Kyushitsukai and became a member. In 1936 he got married and changed his last name to Matsumoto, named his studio Sogokobo and along with his wife Teiko, created a new drawing and essay magazine, "Zakkicho". In opposition to an article discussing wartime cooperation in the January issue of Mizue Art Magazine, Matsumoto presented Living Artists in the April issue. The same year he also opened a joint exhibition with Yasutake Funakoshi at the Kawatoku Gallery in Morioka. In 1943 he formed the Shinjin Gakai with seven others, including Aimitsu, Aso Saburo, and Terada Masaaki. This society opened three exhibitions. In post-war 1946 with the widespread distribution of a piece of the "Questioning all Artists of Japan", Matsumoto set up an artists' organization and helped to revitalize the lost sense of community and partnership among artists. In 1947, along with the members of the Shinjin Gakai, he participated in the Jiyu Bijutsuka Kyokai. In 1948 while working on two pieces, Woman with a Sculpted Head and Building, for the Second Bijutsudantai Rengo Exhibition sponsored by the Mainichi Newspaper, he became sick and died in his home, Tokyo on June 8th at the age of thirty-six. 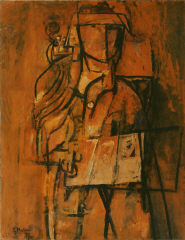 Matsumoto's works start off in his early years in a style likened to that of Modigliani, and in his later years his art is characterized by delicate matiere and unemotional lines used to portray city motifs in an intimate manner.